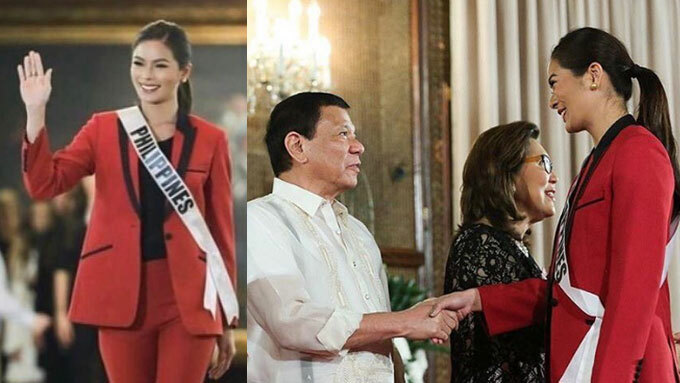 Miss Philippines 2016 Maxine Medina ecstatic about fulfilling "childhood dream"
Philippine bet Maxine Medina during her courtesy call to the President Rodrigo Duterte. Today, January 23, the 86 Miss Universe 2016 candidates paid a courtesy call to Philippine President Rodrigo Duterte in Malacanang Palace. Among the candidates who related their experiences with President Digong was none other than our very own Maxine Medina. The beauty queen wrote, "What's more inspiring is that the leader of the Philippines wished me good luck. Thank you, President Duterte." She added, "I'm a proud Filipino and it is a great honor to represent our country, the Philippines!" Maxine revealed she never imagined herself "walking on the halls of the Malacanang Palace," so what happened earlier was that a "childhood dream" came true. Also, she didn't forget to thank her supporters, "Maraming salamat po at sana po ay patuloy ninyo akong suportahan sa laban natin. "Isang karangalan po na maging mukha ng Pilipinas sa Miss Universe." During the courtesy call, Maxine was clad in an Edwin Tan creation. The grand coronation night of the 65th Miss Universe will be on January 30, 2017, at the SM Mall of Asia Arena in Pasay City.